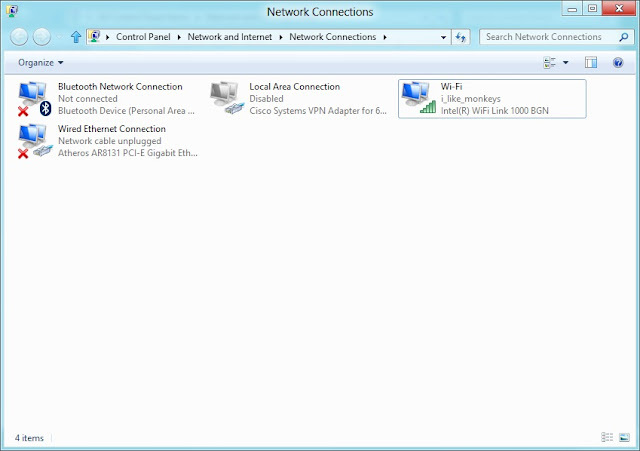 As you can see the WiFi card found the WiFi network there was just no TCP information coming down from it. 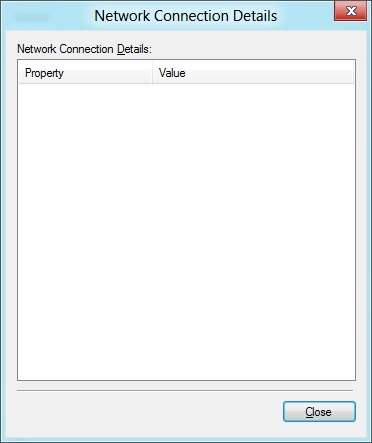 What I was able to figure out is that there’s some TCP/IP setting which isn’t being saved correctly (or at some times is being wiped out from the registry for some unknown reason). 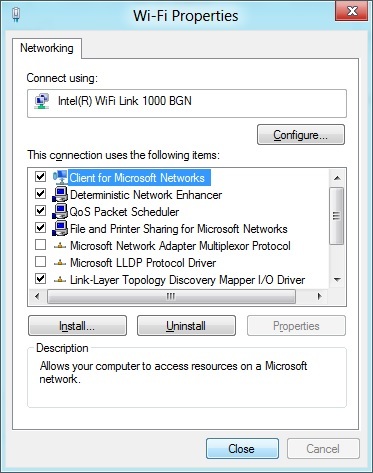 To fix the problem in the Network Connections window (shown above) double click on of the network icons (I used the WiFi one). To verify the problem is the same you should see no bytes being passed at all. If you click details the box which would normally have all sorts of useful information will be blank. Close the Network Connection Details and on the Network Status (WiFi Status in my picture above) click the “Properties” button. 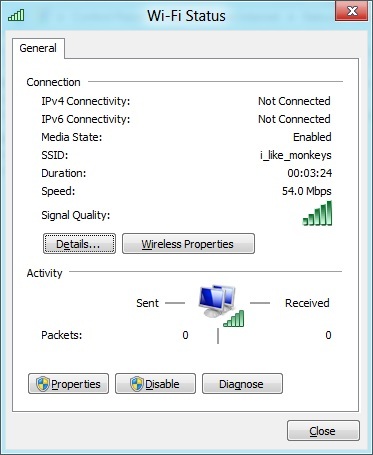 In the list in the middle scroll down until you find “Internet Protocol Version 4 (TCP/IPv4)”. Select this and click the properties button. This will show you a window similar to the following. If you have values specified in this screen that are different from my settings shown in the screenshot DO NOT CHANGE THEM! 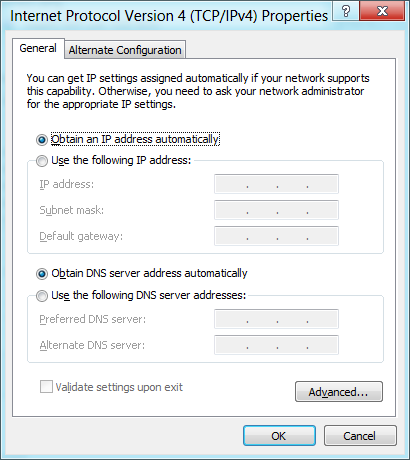 If you change these settings without knowing what you are doing you won’t be able to get online and only the person who setup your network will be able to help you fix the problem! Now click the “OK” button on this screen (without changing anything), and click the “Close” button on the prior screen. You will notice that under the Activity section the numbers are no longer 0, which means that data is flowing through the network card to the rest of the network (and in my case to the Internet as well). 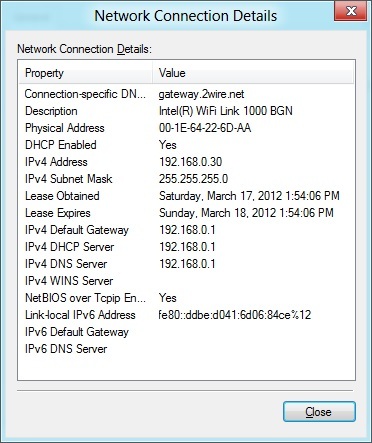 If you click the “Details” button you’ll see you now have an IP address and everything is happy again. 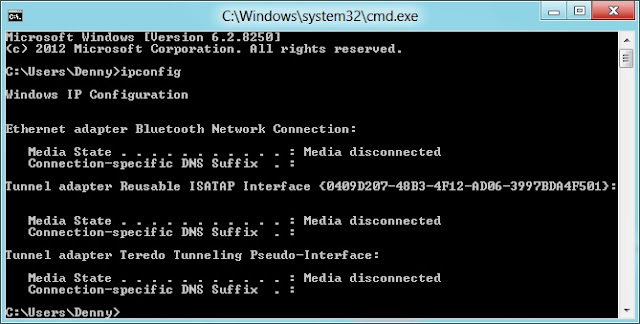 If you look at the output from ipconfig again we’ll see that the network adapter is now listed and is receiving IP address information. If you do end up running into this problem yourself, remember these steps as you’ll probably have to do this pretty regularly.